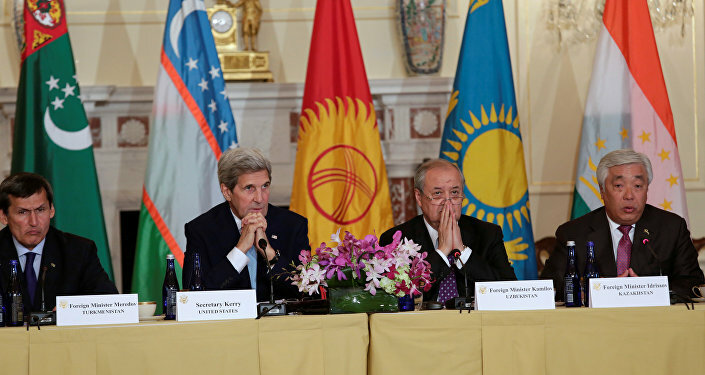 On Wednesday, US Secretary of State John Kerry met with the foreign ministers of the five Central Asian republics of the former Soviet Union (Kazakhstan, Uzbekistan, Kyrgyzstan, Tajikistan and Turkmenistan) in Washington DC. Inevitably, the main question on the minds of most Russian analysts soon became: What is the US up to in the region? The meeting, the second in this format after a similar meeting in Samarkand, Uzbekistan last fall, touched on a wide range of issues, including the security situation in the region, the situation on the Afghan border (which borders Uzbekistan, Tajikistan and Turkmenistan) trade, investment and even clean energy initiatives. US officials have repeatedly said that the C5+1 (Central Asian 5 plus the USA) is not directed against Russian and Chinese interests. However, as Svobodnaya Pressa journalist Andrei Polunin pointed out, in "all previous American projects in the region, from 'Greater Central Asia' to the 'New Silk Road' to the 'Greater Middle East', the US has explicitly competed with Russia and China for leadership and influence." For instance, Polunin suggested, Uzbekistan has suddenly become a major recipient of US military aid, with Washington appreciating Taskhent's moves to remain neutral in relations with Moscow and Beijing, and its leaders' decision not to join Russian-led military and economic institutions including the Collective Security Treaty Organization and the Eurasian Economic Union. "However, the beginning of an insurrection by radical Islamists in the city of Andijan, which Uzbek authorities have come to regard as having been inspired by 'outside forces', have cooled ambitions to move closer to the United States." For its part, the government of Turkmenistan, which also formally holds a neutral status in foreign affairs, indicated a year ago that it would not be averse to receiving US security guarantees, and in return may provide the US military the use of the Mari-2 airbase. Meanwhile, Tajikistan, which already has security guarantees in the CSTO framework, is considering joining the Eurasian Economic Union, but is vascillating between support for closer integration with Russian-led institutions and a 'multi-vector' approach. "Factually," Polunin noted, "the US is attempting to counteract the expansion of Moscow's influence over the entire former Soviet space. In addition, Washington's priorities in Central Asia also formally include the fight against international terrorism and preventing the growth of Chinese influence." Speaking to Svobodnaya Pressa, Stanislav Tarasov, director of the Middle East-Caucasus Research Center, suggested that the C5+1 framework is in line with President Obama's faltering efforts for making a geopolitical shift from the Middle East to Southeast Asia. According to the analyst, having failed to strengthen their positions in the Far East, and seeing their losses compounded by over a decade of military setbacks in Afghanistan and Iraq, Washington is attempting to shift efforts toward the destabilization of Central Asia. Fortunately, Tarasov suggested, the chances of hawkish US policymakers' efforts actually succeeding are low. For his part, Mikhail Alexandrov, a senior expert at the Moscow State Institute of International Relations' Center for Military and Political Studies, suggested that the US strategy is explicitly aimed at encircling Russia along its 'soft southern underbelly'. "The US strategy of encircling Russia and China is a long-term one. So far, it has not led to any significant successes, and has even failed in some points. For example, in June 2014, an official ceremony was held in Manas, Kyrgyzstan closing the US airbase there. But the Americans have not given up, and continue to stick to their policy line." Fortunately, Alexandrov noted,"it must be said that in recent years the governments of Central Asian countries have learned to understand the difference between real diplomacy and diplomatic con artistry at which the US has become an expert. In my view, only Ukraine succumbed to such con games in the post-Soviet space. And now, having witnessed the dismal example of Ukraine, the heads of the Central Asian countries are very cautious about moving closer to the United States." "At the same time, they find it beneficial to demonstrate their formal independence from Russia. Therefore, they do not reject dialogue with Washington. It allows them to hint to Moscow that if Russia does not provide assistance, including financial assistance, these countries may correct their foreign policy to a pro-American line." "In this way," the analyst suggested, "the Americans will create the appearance of influence in the region, and of pressure on Russia. This enhances the international prestige of the United States, and strengthens the virtual image of a powerful empire, present everywhere, and able at any time to collect foreign ministers from around the world and hold briefings with them. Given the US's falling global prestige, such a PR campaign is important to them." However, asked whether the meeting's results will have a real effect on the balance of power in Central Asia, Alexandrov said that he doesn't believe it will. "In my opinion, Turkmenistan will not allow the US to use the Mari-2 airbase under any circumstances, and Uzbekistan will refrain from any real steps toward the Americans. But the Central Asian countries will receive money from the US to strengthen their security and conduct domestic policy reforms. Effectively, the Central Asian countries and the US are now courting each other, waiting for the moment when it becomes advantageous to 'drop' the other partner," the expert concluded.